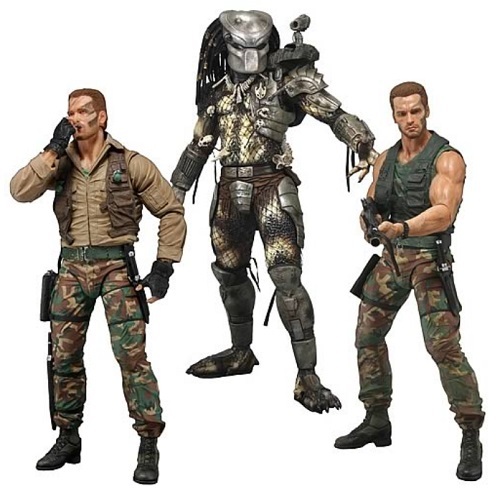 Product Detail Summary: This action figure collection celebrates the 25th anniversary of the original 1987 Predator film with the long-awaited and much-anticipated debut of Arnold Schwarzenegger as Dutch Schaefer! The hero comes in 2 different versions. Jungle Extraction Dutch is faithful to his appearance as they first entered the jungle, complete with military shirt and vest, over 20 points of articulation, an M-16, a pistol, a machete, and a knife. Jungle Patrol Dutch is immortalized in his camo muscle shirt and vest, sporting over 20 points of articulation, an M-16, a pistol, and a knife. Also included in this Series 8 set is an updated version of the Masked Jungle Hunter Predator, featuring an additional ball-jointed hip and double knee articulation, over 25 points of articulation, extendable wrist blades, and a removable backpack! Ages 17 and up.